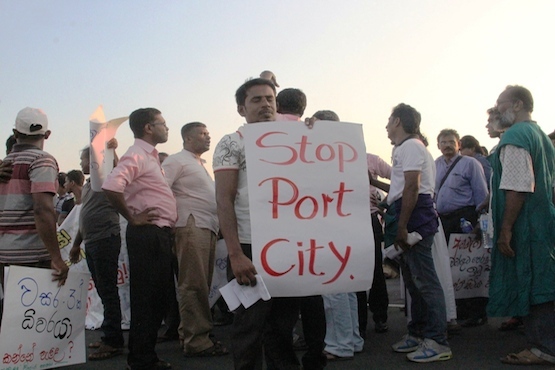 The Colombo Port City Project is one of the most controversial infrastructure projects in Sri Lanka contested by the People’s Movement Against the Port City. 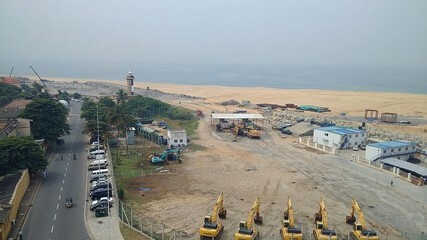 The Colombo Port City Project is one of the most controversial infrastructure projects in Sri Lanka . The original proposal to create a Colombo Port City was made in 2004. It involved small-scale sea reclamation subjected to a thorough and comprehensive study. In 2010, there was an initial report which was not considered comprehensive enough, and the project has changed several times during the following years . "Initiated by the former President Mahinda Rajapaksa with a vision to rejuvenate Sri Lanka’s stagnant economy, the project is worth about $1.4 billion. The Chinese President Xi Jinping and former Sri Lankan President Rajapaksa officially launched the port project in September 2014. Soon after Maithripala Sirisena became President in January 2015, however, he suspended the contract in March 2015, citing various shortcomings, irregularities and ecological issues. But this suspension was temporary in nature, and the project was revived in March 2016. The project has, nonetheless, raised questions on the Sirisena government’s probity, which came to power questioning the huge investment by the Chinese in Sri Lanka, which he argued would lead to an avoidable dependence on China" . "The Colombo deal was first signed in November 2013 between the Rajapaksa Administration and the Chinese state-owned firm, China Communications Construction Company Pvt. Ltd. (CCCC)" . The most debated controversial issues are ecological adverse impacts, negative impacts on fisher people, land ownership, and controversies about compensation . Regarding environmental impacts, Patrick claims that "the Rajapaksa administration did not undertake any comprehensive Environmental Impact Assessment (EIA) of the project prior to its approval. Activists have been highlighting the serious environmental implications of the project, especially with regard to massive granite extraction and land reclamation. The demand for granite on the construction site has resulted in large-scale exploitation by mine owners. This has led to falling ground-water levels in the area, posing serious water shortages for the island nation. On a larger scale, reclamation and extraction are destabilizing the ecology of the region, leading to increasing natural disasters in sensitive areas. However, the Sirisena administration has not yet addressed these environmental issues and has chosen to continue with the project" . With regards to the impacts on fisher people, in 2007, the Rajapaksa administration promised a compensation of 1,000,000 Sri Lankan rupees ($ 6,294) to each fisher affected by the project, but later failed to fulfill its commitment. The project has led to large-scale displacement of the fisher community. The large amount of sand dredged in the reclamation process is becoming a major concern for fisher people using traditional methods of fishing, usually undertaken in shallower waters. After the revival, the project company has promised to allocate 500 million Sri Lankan rupees ($314,703,90) to the fishers' income support programme through the government of Sri Lanka . The People's Movement against Port City has been organizing a range of protests in the last years. In 2016, hundreds of religious representatives, fisher people, activists and citizens have taken to the streets of Colombo to protest against the reopening of the construction project of the Port City funded by China . They claimed that the project will kill the fishermen, and expressed their concerns that the project will bring "incalculable" damage and irreversibly destroy " the whole area’s marine and biological respources" . On 6th of January 2016, the People's Movement against Port City held a public hearing over the EIA report at the Centre for Society and Religion (CSR) in Colombo with the participation of more than 300 people. At the end of the public hearing, they marched to the Department for the conservation of the coast and the Coastal Resource Management (Cccrmd) and presented an Environmental Impact Assessment (EIA) of 400 pages, containing 128 negative opinions about the construction . The protesters claim that from the beginning the project sparked the opposition of the local community, which first succeeded in securing its suspension. 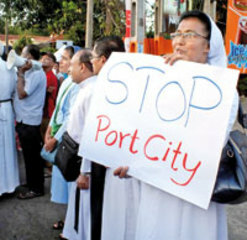 In December 2017 as well, the Sri Lankan Catholic Church has brought a range of social groups together in order to protest against the Colombo Financial City Project. However, wide protests highlighting issues faced by fisherfolk, as well as the adverse impact on fish breeding areas, damage to coral reefs and coastal erosion, halted the project. Project Details Port City Colombo is a city development project built as an extension of the existing Colombo CBD with an initial investment of US$ 1.4 billion and an expected US$ 15 billion overall investment when completed. Spanning 269 hectares, it is a sea reclamation project joined to the current central business district. Port City Colombo is made up of 5 different precincts which is the Financial District, Central Park Living, Island Living, The Marina and the International Island. When completed, Port City Colombo is estimated to have some 5.65 million square metres of build up space including offices, medical and educational facilities, integrated resort, marina, hotels, among others . On 6 March 2015, the project was suspended by the Sirisena government, citing allegations of corruption against the Rajapaksa Administration, and the absence of a feasibility study before the contract was awarded. During this period, the Chinese company incurred a daily direct loss of $ 380,000. The suspension also led to direct and indirect adverse effects on the on-site workers, both Chinese and Sri Lankans. Despite ecological concerns and allegations of corruption, in March 2016, the government resumed the port project, signifying its importance for Sri Lankan economy. Development of Alternatives The People’s Movement against the Port City demands the abolition of the project.